The annual National Design and Arts competition is seeing an increasing number of participants since its inception in 2002. From about 50 participants in 2005, this year’s 17th National Design and Arts competition saw around 200 participants. The participants competed in the five different categories of gho, kira, embroidery, contemporary art and traditional paintings. The categories in contemporary arts and traditional paintings have been introduced from 2016. 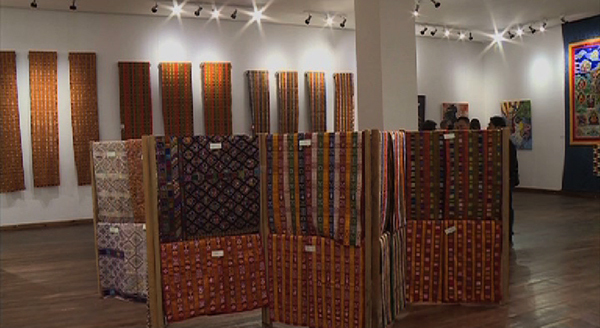 “Weavers and artists were recognised for their works. It is also to encourage them to continue their works, we have expanded our competition and increased the prizes as well,” Rinzin O Dorji, the Executive Director of RTA, said. The winners of the competition were provided Nu 120,000, the first runners-up were given Nu 60,000 and Nu 32,000 were provided to the second runners-up. The cash prizes and certificates were awarded on Monday. 52-year-old Norbu won the first prize in the embroidery design category and it is his third time winning in the same category. Also, for Thinley Zangmo, it is her third time winning first prize in the kira category. According to the officials of the Royal Textile Academy (RTA), the quality of the products has also been improving over the years. The participants were judged on the criteria of aesthetics, technical application and marketability. The RTA started the competition with the aim to recognise and reward the weavers and artisans.